Apartment and condominium residents can have recycling collection brought right to their door! With a convenient Blue Bin recycling dumpster it is easier than ever for multi-family residents to recycle. There is no extra charge for the program. Interested property managers or condo boards can call the Waste Management Services Customer Support Centre at 780-496-5698 to arrange for the service. When the logistical details are worked out, such as where to put the bin, the blue bin will be placed on site and everyone can start recycling. As buildings sign on, the City will deliver information and promotional materials to residents. Property managers will also receive instructional posters for common areas. Edmonton's recycling system is very user-friendly. No sorting is required by residents. That is done at the City's Materials Recovery Facility. Who is Eligible for Blue Bin Recycling? All apartments, condos and townhouses that are not part of the Blue Bag program. What Can I Recycle in My Building's Blue Bin? Information on setting up waste bin enclosures at multi-unit sites. Site manager responsibilities for garbage and recycling storage and collection. Posters, how-to guides, and more for apartment and condo tenants and site managers. My complex does not have a blue bin, why not? Interested property managers or condo boards can call the Waste Management Services Customer Support Centre at 496-5698 to arrange for the service. There is no extra charge for the program. When the logistical details are worked out, such as where to put the bin, the blue bin will be placed on site and everyone can start recycling. Some apartments and condominiums have blue bag rather than blue bin collection due to specific site needs for blue bins. 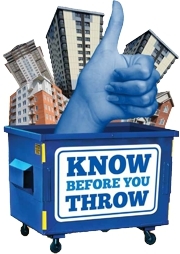 If your building does not have a blue bin, your household recycling can be taken to a Community Recycling Depot. What can go in the blue bin for recycling? Most cardboard and paper can go in your blue bin for recycling. This is a great place to start. Flatten cardboard boxes to save space in your blue bin. Many plastic, metal and glass containers from your home can also go in your blue bin. Recyclables can be put directly in your blue bin. No blue bag is required! Materials in the blue bin will all go to the City's Materials Recovery Facility where they will be sorted for recycling. Refer to What Can I Recycle? or the What Goes Where poster to identify what should go in your building's garbage bin, blue bin and what needs to be taken to the Eco Station. What does not belong in my garbage or recycling bins? Garbage and recycling bins are for small household waste only. What can I do with large furniture and other items I can't put in my waste bins? Unacceptable items should be taken to the Eco Station or to the Edmonton Waste Management Centre. If you don’t have a suitable vehicle for hauling large items, private haulers can be found by doing a web search for 'Edmonton Garbage Collection' or in the Yellow Pages under 'Garbage Collection'. Have a question about a specific item? Use the WasteWise search tool.